With acceptance letters coming in for a lot of high school seniors, it can be hard which college to go to. I remember when I had to make this choice two years ago, and it stressed me out so much. I am a very indecisive person, so for me, this was something that I struggled and grappled with for many days. I had no idea where to even start, or how to even go about choosing the right college. I was already stressed enough about leaving home, and for college in general, so it was a scary thing to decide where to spend the next four years of my life. 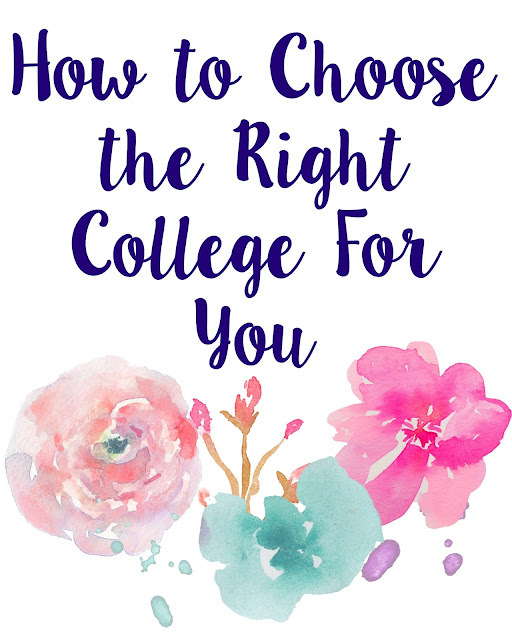 I completely understand how you might be feeling right now, so I decided to make my own guide on how to choose the right college for you! 1. If you can, visit every single college you are accepted to, and are considering. This may seem like a daunting task, but if you are seriously considering going to a college, you should definitely visit it first. If you don't think you are going to attend a college even though you were accepted, don't bother visiting it, but if you are seriously considering going to a school, it is very important to visit it in order to get a feel for the campus. I cannot explain how important this is; you could potentially be spending the next four years of your life there, so you should visit to find out if you could actually see yourself attending the school. When I was making this decision two years ago, I was seriously considering two universities out of the four I had applied to. I was really struggling with the decision, so I visited both campuses to physically be there. As soon as I got the University of Washington campus, I knew I was home. I can't really explain the feeling, but I immediately felt comfortable and could see myself going to classes there, and really fitting in. This feeling is like the "Say Yes to the Dress" feeling, but I don't know if it's something that everyone experiences. It's really helpful, though, to visit all of the campuses of the universities you are interested in, and compare how you felt at all of the different locations. 2. Do it Rory Gilmore style and make a pro/con list. If you are a Gilmore Girls fan like me (who isn't?! ), then you are probably very familiar with Rory's pro/con lists when it comes to making decisions. I have always done this when I can't decide between two things, and with this decision, it helped out a lot. It's really important to take into account all of the different factors of college, like where it is located, what majors they have, their rank, class sizes, etc., because this is where you will be furthering your education in order to make a career for yourself. After you make your list, chances are you will have already made up your mind by the end, and if you haven't you can mull over the list for a couple of days and see if any more pros or cons come to you. 3. Take into account what you think you will be majoring in. This is very important, because you want to choose a school that actually has the major you want, or think you might want. It's totally fine to change your mind later on down the road, so just make sure that you will have options at the university you will attend. Different universities have different majors, so keep in mind what you think you will study. It's also important to know which schools have better departments. For example, University A and University B might both have a mechanical engineering department, but University A has a better one, so it would be in your best interest to choose that school. 4. Compare scholarship and financial aid offers. College is very expensive, so it's important that you are getting the best "deal." If you are offered a really great scholarship to a school that is your second choice, and offered a lesser scholarship at your top choice, sometimes you can email them and let them know that. You can explain that you got a better offer to a different school, and see if your top choice school is willing to give you a better scholarship in order to get you to attend. This doesn't work all the time, though, but it is worth a shot. Cost can definitely be a deciding factor, so do some investigating on how much you will actually be paying to attend a university. If your dream school is also very expensive, call the financial aid office and ask them about payment plans, loans, and scholarships that can help combat the costs. Most times, they are happy to help, and you can also find a lot of information online. 5. Think about your life and career goals. I know this can be scary to do when you are only 18 or 19, but it's important to think about where you see yourself after you have graduated college, and what your career goals are. Do some research on which universities have produced successful people, and also which one has a lot of connections to potential employers. Once you get to college, it's very important to start thinking about what you will do with your life, and what kind of career you will have. The connections that universities have can be vital in having a successful career, so keep that in mind when you are trying to decide which college to attend. 6. Talk to people who attend the universities. You won't get an as in-depth view of what a university is like from anyone other than a current or former student. This will greatly help you to understand what life is really like at the university, because you will get a very unique point of view. If you are seriously considering attending a college, I would definitely suggest talking to someone who goes there. I did this, and it really helped to further envision myself actually going to the school. This can also be really useful to help make a decision if you are considering multiple schools. Leave the decision until last minute. This will only make you rushed, and probably leave you with a decision that you will not be happy with later on down the road. It's very important to give this decision a lot of though, and the time you need to really find the right university that will allow you to be the most successful. Make sure you know all of the decision deadlines, because it might be possible that they are different for each university. You don't want to miss a deadline because you are procrastinating on a decision. Let other people influence your decision. How are you feeling about college? Yeah visiting schools is so important! Aww that's too bad! I bet that was super frustrating :( That would be super difficult transferring to a different school and having to start all over again with getting to know the campus!